It may happen on a sunny day … or in the middle of the night during a winter rainstorm. The “big one” – an earthquake of unimaginable power. The ground will shake so hard we can’t stand, for what seems an eternity, really 3 to 5 minutes. This quake may destroy bridges, roads, power poles & lines, water and sewer lines – leaving an unimaginable mess. The sea will pull out, and a few minutes later the tsunami – a wall of water and debris 30′ to 80′ in height – will roll inland for a long ways. It may bring ships and barges, toss boats and logs like toothpicks, move cars and trucks like toys, and devastate buildings. Both in-bound and out-bound waves, one after another, will do their damage for hours. Then with the calm, will come the realization of the enormity of the disaster. Cape Meares has an Emergency Preparedness group that is headed by local resident, Pete Steen. Recently Mr. Steen compiled a document that is important for every resident in the community to review and even have a printed copy in a “Go Bag” that might be necessary following a major earthquake. The document is in a PDF format and an application like Adobe Reader is required to view it. The combination of quake and tsunami may leave us without shelter, isolated and self-reliant for a week or several weeks until significant outside help can arrive. However, the powerful local quake and tsunami are very survivable if only we prepare ahead, then act calmly and quickly when they strike. As soon as we can stand, we grab our Emergency Grab & Go kit. Walk the route – we practiced several times – quickly uphill. Forget the car, as the roads will be impassible, or quickly clogged with broken structures, trees and debris, including abandoned cars. The key to survival is being prepared. We have collected information from a variety of sources to help you prepare and plan for safety and survival should we encounter a disaster. Familiarize yourselves with this section of the web site and make use of its planning information. In a disaster, first responders will be so overwhelmed we each need to be prepared to save our selves and our families. All of these are survivable, if you and your family plan ahead. As you prepare, tailor your plans and supplies to your specific daily living needs and responsibilities. Most or all individuals have both specific personal needs as well as resources to assist others. You and your household and others you help or rely on for assistance should work together. As part of tailoring your plans, consider working with others to create networks of neighbors, relatives, and friends who will assist each other in an emergency. Discuss your needs and responsibilities and how people in the network can assist each other with communication, care of children, pets, or specific needs like the operation of durable medical equipment. Create your own personal network for specific areas where you need assistance. Once you’ve collected this important information, gather your family members and discuss the information to put in the plan. Talk to your neighbors about how you can work together in the event of an emergency. You will be better prepared to safely reunite your family and loved ones during an emergency if you think ahead and communicate with others in advance. Practice your plan at least twice a year and update it according to any issues that arise. A series of Emergency Links have been created of sites that may prove to be sources of critical information both during and after a disaster. Becoming familiar with these resources is important and having an emergency radio available and handy should you need to evacuate your home is very important. Why did the County decide to quit using the sirens? It wasn’t just the county. Over a year ago, some of the Cities decided they no longer wanted the responsibility and financial burden of maintaining the sirens. As a result, several community meetings were held to discuss options. From these meetings, several Committees were formed to look at everything from siren placement, to financing options. Then why did it take so long before you decided to no longer support the sirens? The decision was delayed for a period as we awaited the release of the new Oregon Department of Geology and Mineral Industries Tsunami Inundation Maps to see what the latest science would show us. So, now that you decided to not support the sirens, if we have the big one, in the middle of the night, how will we know about it? A Cascadia Subduction Zone Quake that would give us “the Big One” will be 3-5 minutes of severe ground-shaking resulting from a 9.0 earthquake that also throws and breaks things around your house and makes it hard to stand. If you experience severe ground shaking, you have approximately 15-20 minutes to get to the safe side of the Inundation Line. Do not delay leaving if you live in the Inundation Zone, your life may depend on it! If the siren wasn’t to warn us of the “Big One”, then what were they for? There are two types of Tsunami’s, a local and a distant Tsunami. We already mentioned the severe ground shaking is your warning for the local event, and that you should immediately get out of the inundation area. If the quake is big enough to generate a tsunami, it will be big enough that we feel it locally. The Sirens could warn us of a distant event. The Worst-Case event is a Tsunami generated from a M9.0+ earthquake in the area of the Alaskan Aleutian Islands. This would give us a tsunami equal to the one generated during the Good Friday Earthquake in March 1964. Even then the tsunami for us in Tillamook County would be measured in centimeters. So, with a distant tsunami, how long do we have to get out of the inundation zone? We would have approximately 4 hours to respond to the above worst case event. During the Japan March 2011 event, we had around 9 hours. Cape Meares has taken steps in recent years to prepare for various kinds of disasters that may be faced in the future. One of the highly successful programs was called Map Your Neighborhood. Our community has been sub-divided into six neighborhoods and meetings have been held to discuss how neighbors might help each other in the event of an emergency. Should there be a serious local earthquake disaster there is a high probability of a following tsunami. Local residents would have approximately 18-20 minutes to get to higher ground to be outside of the inundation area. 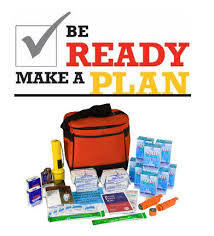 In anticipation of a major quake and a following tsunami every resident is urged to have a Emergency Grab & Go Kit. By clicking on the link to the kit in the previous question you will find suggestions of items to include in the kit. Finally, lessons have been learned from individuals who have been involved in earlier disasters. One major fairly recent disaster is the one that followed Hurricane Sandy that affected the northeast area of the United States and millions of people. What did we learn? Links to various forms of emergencies.